Today is my in-law's 60th wedding anniversary. How many couples have the love, luck and fortitude to make it to this milestone? Happy anniversary, Bill and Margaret. Tour de Fleece: I'm so happy I joined this challenge. I've discovered that I absolutely love spinning on Bekki the Traveller. I thought Florence, the DT Lendrum, was going to be my forever-and-always-wheel. Who knew that a single treadle could be such fun? 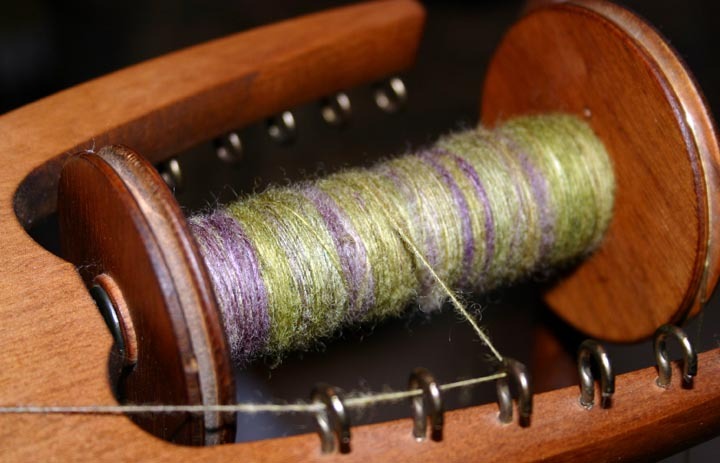 Originally, I tried to learn to spin on a single treadle Ashford Traditional (it was such a dog. I hated that wheel). I never thought I'd buy - or spin - much less love, an Ashford. And trading off between the two wheels is a breeze. Now I can have two different projects going at once. Wonderful! I spent an hour yesterday afternoon working on my Tour challenge. At midnight, I came back and spun for another hour. I just couldn't resist. It was so peaceful - the house was quiet, everyone asleep. Just the whirr of the wheel and the satisfaction of watching roving turn into yarn. Summer Spinning Challenge: No spinning today but I'm still on track to meet my goal of four hours this week. I spun for an hour yesterday, using the Lendrum for Grover's fleece. I tried to pick more of the wool - I need to surrender the picker to Susie tomorrow and I probably won't have it again until September or so - but found that some is still greasy. I separated out the sections that need to be re-washed and will take care of that this weekend. I have plenty of picked fleece to spin; but I've only processed about a pound of the 7.5 pound fleece. Good thing I have until the Fall Equinox to complete this challenge.